The Raritan River region is the home of many businesses, residential communities, critical facilities, and wildlife species. Flooding is a persistent problem in the Raritan River region when excessive rain from storms affect the river basin. During hurricane events, flooding can be even more severe due to combined storm surge and heavy rainfall effects. For example, record flooding in the aftermath of Hurricane Floyd has wreaked havoc in the Raritan River region, paralyzing major transportation links along the waterfront. The Raritan River is also a living laboratory for Rutgers students to study and explore some challenging environment issues like biodiversity, water pollution, endangered animals, sea level rise impacts to wetland, and storm water management. 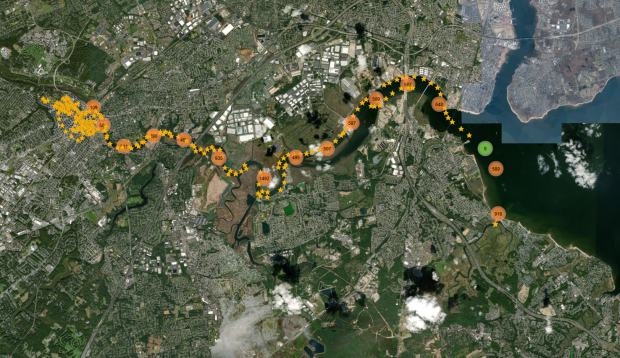 These investigations can be greatly facilitated if geospatial data sets capturing the spatial and temporal changes of the Raritan River environment can be collected over time. To support virtual exploration of the Raritan river environment, the Digital Raritan River, a rich digital environment consisting of high resolution lidar data and Google street view style imagery, was conducted by Dr. Jie Gong, Dr. Jennifer Whytlaw, and Rutgers graduate students Yi Yu, Sun Ho Ro, and Mengyang Guo. With the support of a Rutgers Raritan River Consortium minigrant, the research team installed a mobile lidar system onto the Rutgers research vessel (the R/V Rutgers) and successfully captured geospatial data along the large segment of Raritan River waterway at the driving speed. Once the geospatial data were collected in the field, they were postprocessed into various geospatial data products such as geo-referenced point cloud data and street-view panoramic imagery. These data have been shared through a cloud server, which provides various user interfaces for data visualization and analysis. A notable example is Inundation Risk Information System (IRIS) viewer, a platform for visualizing and analyzing point cloud and geo-referenced photo data. The aggregation of these data sets and the dedicated visualization tools form a rich digital environment that can be used to support resilience centered investigations such as identifying properties potentially impacted under future flooding risks. The digital environment can also be used by students to examine other resilience related issues such as biodiversity, river deposits, and channel erosion. For more information, contact Dr. Jie Gong at jg931@soe.rutgers.edu. Dr. Jie Gong and Dr. Jennifer Whytlaw presented a summary of their research at the November 8, 2018 Rutgers Raritan River Consortium breakfast meeting. View the presentation here. Images of data locations on the Lower Raritan and researchers aboard the R/V Rutgers provided by Dr. Jie Gong.